Location: 121 E. Costilla St. Hours: Wednesday – Friday 4-10 p.m.; Saturday 3-10 p.m.; Sunday 2-7 p.m.
Planning solo trips and exploring the town around you is a great way to discover hole-in-the-wall treasures and unique stores you never knew existed. A great place to start is COCO Crafted. COCO Crafted, located at 121 E Costilla St., provides specialty workshops designed to assist people in crafting DIY projects and other self-made items. According to the COCO Crafted website, workshops include calligraphy, taxidermy, woodworking and children’s programming. Crafters can choose from seven projects, including a floating shelf, embroidery hoop art and a hanging moon phase wall decoration. The standard cost for a craft is $25. Your creation will last up to seven to eight months, and you have the satisfaction of making something with your own hands. COCO Crafted also has special offers for students on Wednesdays where crafts are only $18 and various monthly discounts. The crafting business is branded as a place to make your Pinterest board dreams come true. Walking into the building, you are greeted by a warm but clean aesthetic that has been carefully curated. Music, ranging from Sylvan Esso to Kendrick Lamar, plays in the background. 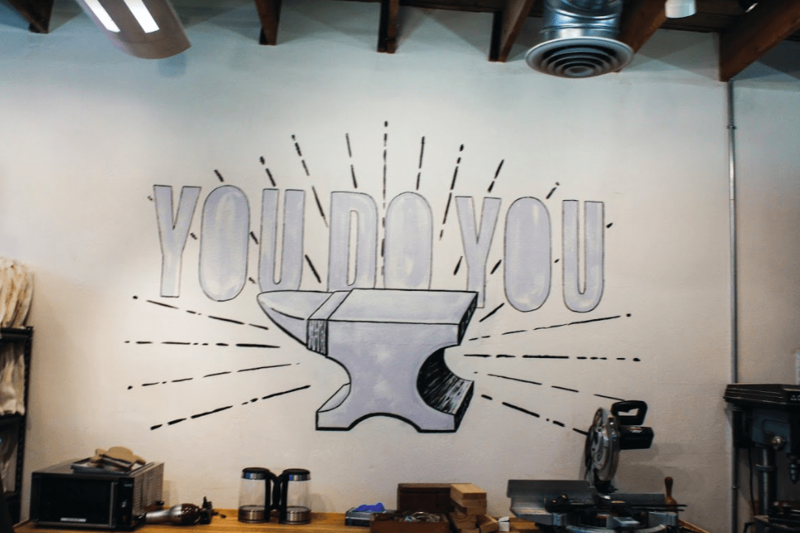 Reclaimed wooden tables and floors, a large mural depicting an anvil with the words, “You Do You” and other art pieces adorn the walls. 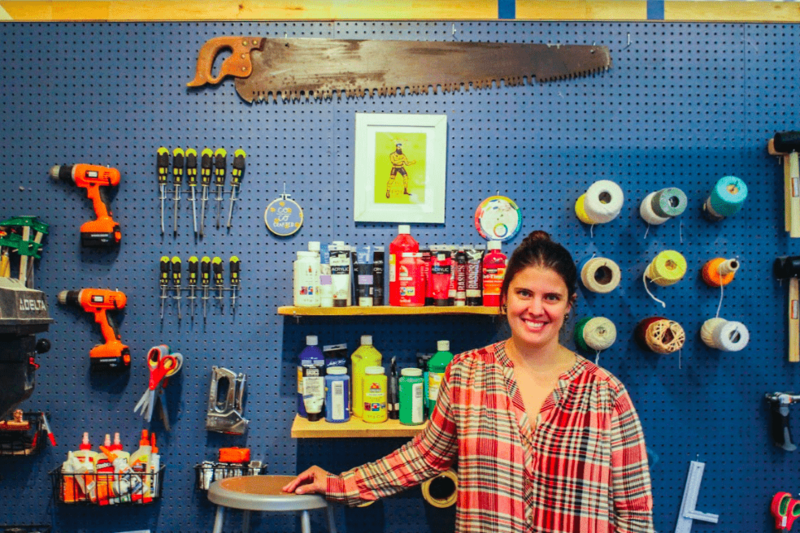 Mundi Ross, creative director for the Colorado Collective, the parent company of COCO Crafted, says that she wants to “cultivate makers”” through offering classes and workshops focused on subjects that cannot be easily tackled by the average crafter. “Whether you’re nine or 99, you can craft,” she says. After signing a waiver to use certain tools provided at the establishment, you are directed to the display of crafts. Ross provides necessary materials for the crafts as well as detailed instructions on laminated cards. All of the materials you need and the instruction card are all neatly wrapped in a canvas bag. For this trip, I chose to craft the macramé planter. The crafting process itself was enjoyable and the sense of satisfaction and pride I had in what I had made was surprising. The one thing I would keep in mind is that patience is key. Calm down, enjoy yourself and don’t rush. While the instructions are clear, don’t get frustrated if your project isn’t turning out the way you want. The staff members there are friendly and knowledgeable, so they are a great resource if you get stuck. Something that makes COCO Crafted’s approach interesting is that it allows you to learn l how to relate multiple elements in crafting to other areas in your life. For example, making quick repairs around your apartment, designing unique and custom items, and curing boredom. Students interested in signing up for a workshop can visit cococrafted.com.